Belgian scientists turn polluted air into hydrogen fuel « Adafruit Industries – Makers, hackers, artists, designers and engineers! To save the environment, humanity needs to do two things: reduce harmful gases and produce more energy from “green” energy sources. While plenty of research projects have tried to tackle these independently, few do both at the same time. 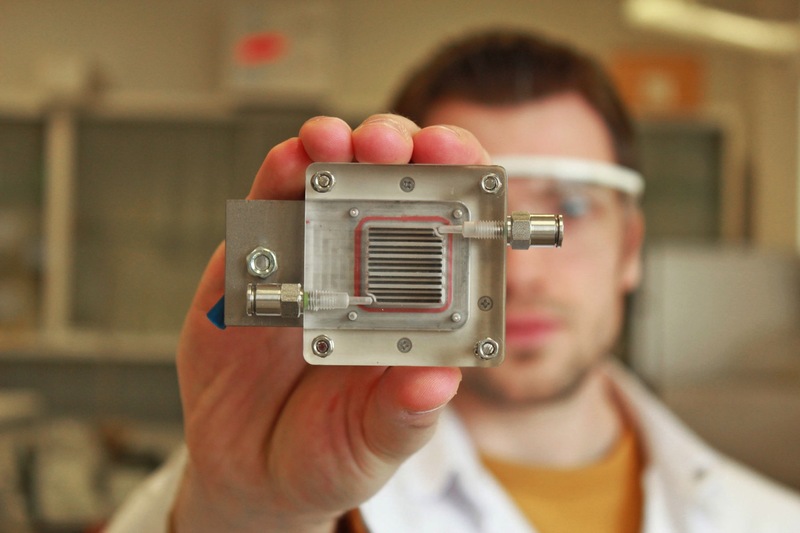 Scientists from the University of Antwerp and KU Leuven (University of Leuven) in Belgium are developing a device that cleans up the air and generates power at the same time. It relies on a process called ‘heterogeneous photocatalysis,’ which uses light and a special catalyst (typically a semiconductor) to trigger a chemical reaction. Heterogeneous photocatalysis has been used before to siphon hydrogen from water and nullify gas-based pollutants. Rarely are the two used in combination, however. The research team has solved this with a “photoelectrochemical cell,” which uses a solar cell to produce hydrogen in a similar manner to electrolysis water-splitting. It has two “rooms,” according to Professor Sammy Verbruggen, separated by a membrane to isolate the two processes. Air is purified on one side with a photoanode, while the hydrogen is generated from “a part of the degradation process” with a cathode tucked behind the solid electrolyte membrane. The reaction that produces hydrogen also releases CO2, a greenhouse gas! This device exchanges one problem for another. The best thing to do with sunlight is produce electricity so you don’t have to burn smog-producing fossil fuels in the first place.